Prom is a very thrilling time for our students and we want our kids to have a great time and celebrate. We don’t want to see this time of celebration turn into a time of tragedy. Serious injury or death can turn what should be a new beginning into a tragic end. 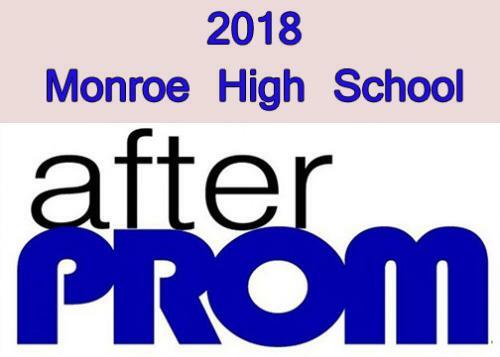 The Monroe After-Prom Committee and Monroe Abstinence Society (MAS) are excited to host another After-Prom at the high school from midnight to 3 am following Prom on April 27th. Parents who have a student attending prom this year, we ask that you talk openly and honestly with them about the dangers and statistics that linger during this time. Please discuss the dangers of drinking and driving and also distracted driving. Tell your child you will be available at any time to provide a ride if they feel as if they are in a unsafe situation. Be sure to confirm the location of parties and find out who is attending and if there will be adult supervision. Let your child know that prom and graduation season is something they should always remember – for the right reason. I hope that you encourage your child to attend the school sponsored after-prom at the high school. This year we will have breakfast foods including a pancake bar, video games, black light dodgeball, inflatable obstacle course, human whack-a-mole, karaoke, and many door prizes. We are giving away a TV, iPads (donated by the Monroe Police Department) and hundreds of dollars in gift cards. All juniors and seniors are invited to attend After-Prom and of course all those that attend the dance are also invited. Students must arrive from the dance by 1:00 am and will be able to leave at 3:00am. Tickets Cost $5 each. After Prom is 100% funded with money raised by the After Prom Committee and MAS through fundraisers and through the generous support of businesses and individuals in our community, like you! As always, we in need of donations for door prizes, food and beverages, and volunteers. If you or your business is interested in helping out or donating to our cause please sign up on Signup Genius at www.SignUpGenius.com/go/30E094BABAB2FA3FD0-monroe1or contact Eric Wellman (ewellman@monroelocalschools.com) or Tracy Yalich (tyalich@monroelocalschools.com ). We want our kids to have a great time and celebrate. We just want them to do it safely and we don’t want to see them get into legal trouble that could have a long-term effect. We do not want to diminish the fun of the evening or make it harder to celebrate. We just want your kids to come home. Please, be our partners in this effort. Help us make sure that every student in Hornet Country is as safe as possible. Thank you. LIABILITY FORM MUST BE SIGNED AND TURNED IN TO ATTEND! !